Our context of theology is unjust. The rich get richer, the poor get poorer. It is a globalized context. Asian nations and countries are incorporated irresistibly into the globalized economy. There are inequalities and disparity in people within both underdeveloped and developed nations. The inequality and disparity in the global context contributes to the widening of the gap between the rich and the poor, the powerful and the powerless in the national and international contexts. As the globalization of market system widens its impact on each and every corner of the world, the wretchedness of the poor people is intensified. In the midst of miseries, atrocities and apathies inflicted on the subaltern and minjung, we ask who is our God? Our God is first of all a God of justice. God is the ultimate and unlimited source of justice, life and peace. God is a unifying source to build a subjective body that would carry out historical tasks for justice, life, and peace. God says, “But let justice roll down like waters and justice like an ever flowing stream.”(Am. 5:24) As justice, God judges and makes null all fake gods and idolatries. In the Exodus, God says, “I am the God who liberated Israel from Egypt.” In the Ten Commandments it is commanded that there is no God except Me. No Imperial God is allowed in this commandment. It commands not to misuse/spoil the name of God; it prohibits any ideological use of God’s name. God’s name is justice. In the New Testament, God is love, which contains a deeper meaning of justice. God of justice annihilates inequalities in states, nations, ethnicities, races, genders, ages, and labor market. God is the embodiment of justice. God is personal, and a person who creates and embodies justice. Justice is the political truth operative in history and society. God calls us to be in the historical truth. Peace and justice, life should equally and mutually define each other. Justice requires peace. Peace creates life and becomes the condition for creative justice. One of my theses will be: Justice is always connected to the subject. Minjung theology affirms that the subject in history is minjung. Minjung are the ordinary suffering people, but they are subjects. Historical subjects are the agents to decide on the mode of a society. In the age of empire, there are at least three subjects and partners operative in the society. One of them is minjung, or the subaltern. I do not suggest here the civil society for the minjung or the subaltern. The civil society where intellectuals and middle class people take the leading position is rather considered as part of the other two: the state and the capital. I need to put an explanation about this conception. The reason I include the civil society in state and capital is that the leadership of the civil society is from state and capital. Leaders of the civil society are workers in the regular official sectors in the society. They are, in a direct or indirect manner, in connection to the two areas, which are state and capital. The latter are major powerful subjects controlling the situation. The third and alternative subject, that is, the minjung, must emerge. I have here a tripartite model of society constituted by three subjects: the state, the capital, and minjung (or, the labor). In the age of globalization, there is another subject: the empire. Empire creates a context in which the three subjects and players interact. Empire, state and capital work together to divide the people and do not allow the alternative subject to emerge; minjung are much “bisected” “disected”, divided and dis-unified. Minjung are han-ridden because of their long sufferings. Empire and global capital and the state are very often divisive and destructive powers. They divide the alternative collective body into voiceless and powerless bisected parts, into irregular, regular, unemployed, part-time, casual workers. Minjung are divided and ripped open and ruled by the capital, the state and the empire. To alleviate the sufferings of minjung in the age of global empire, we may well envisage a relatively just society that is built on a three lateral structure. The three sectors of the structure are the state, the capital, and the minjung. It is an analogy of the three partners which are in a system of collaboration and balance in the welfare state: state-capital-labor. A healthy and just society is supposed to have these three sectors to be in an interactive and mutually balanced relationship. The state and the capital stand on the same side, when they are in dispute with the labor or minjung. But, minjung are di-sected and divided due to the limited supply of employment, the cooptation of the significant segments of the minjung by the capital and the state, and the division of the modes of the employment in terms of the regular and the irregular. Healthy and just society is a society where minjung /laborers are unified and have the unified voice when they deal with the state and the capital. 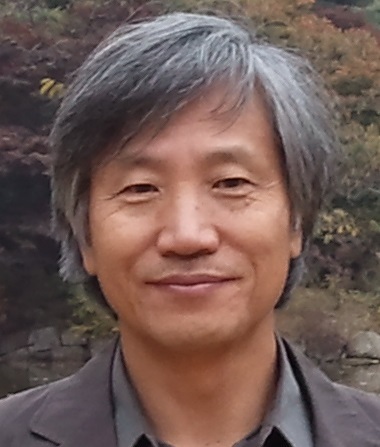 Minjung theology and minjung movement share the common task of empowering the minjung to become a unified subject-body of history to be an equal partner with other partners, the state and the capital. Three sectors are sought to be balanced. The model of the relationship of the three sectors is the divine Trinity. In the Holy Trinity the three partners (God, the Son, and the Holy Spirit) are equal and distinct, and they are in a harmonious and collaborative relation. There is a secular trinity: State-Capital-Labor. The state must be neutral toward capital and labor. The state is to protect both capital and labor. However, one partner among the three, like the Spirit the third person of the Trinity is growing weak and intersected, di-sected, and becoming powerless in the history of the Christian Church. In fact, the Spirit quite often has been represented as the weakest partner in the Trinity. Like Spirit, minjung has been the weakest part in the tripartite society. Minjung has been divided and bi- or di-sected by nationalities, gender, age, race, the regular, irregular modes of employment, caste, class, etc., etc. Minjung, as the subjects of their own destiny, can cooperate together, and become in unity by enhancing their mutuality and cooperation. Welfare state is a dream of less developed countries. Korea is far from being a welfare state when we compare it with European welfare states. But the welfare state itself leaves its welfare-receiving people passive and powerless. People have no right to participate in the decision making of the society. Participatory justice is necessary in both welfare states and underdeveloped states. In this case, justice is not only a matter of distribution, but of power and politics. Distributive justice and political justice (participatory justice) are minimal requirements for full justice. Without equal participatory privilege and power by each of the members of the society, justice therein cannot be justified discursively. Participatory justice is the minimal condition for the social structure to be justified as being just. But in the current world, states and their policy makers at the most focus on distributive justice leaving the recipients of welfare powerless and voiceless. Participatory justice is neglected and ignored. Participation takes place when there is a breathing space for mutual recognition and dialogue/communication within the society. Participation is created by such a “spiritual,” communicative space. Even wealthy welfare states in the West, not to mention authoritarian societies in Asia, lack this dimension of justice. Democracy is generally defined by participation of the people; but, representative democracy replaces people’s participation, which is a major problem facing us. Free election is the core of democracy. But only the wealthy or their proxies can afford to run elections. The current democracies are dominated by wealthy and middle classes. Lower classes and castes are structurally excluded from representing themselves in this capital-intelligence (money and knowledge) dominant world. Lower people are less educated; their children do not receive good education, but only inherit poverty from parents. How can we drill a tunnel in the high mountain that obstructs the path for subalterns and minjung? Where is the solution? Where is the first step toward solution to the problems of distribution and participation? Where must our mission be located at this juncture of history, where neoliberal capitalism and its global market system is ever more widening the gap of the rich and the poor, leaving the poor voiceless and suffering? The capital is mobile and global. In the globalized world, capital is getting more globalized at a speed much faster than its counter parts. It is like a flying chariot of God in Ezekiel. It can go over to any place. But labor and the state cannot go over the borders. Laborers are treated in foreign lands as illegal and discriminated. The subalterns are treated as non-beings. They belong to a society, but they are invisible, and their presence is not recognized. Recognition is required first of all so that they can participate in the society. But they are consciously or unconsciously forced to be void and nothing in society. They are constantly sacrificed as scapegoats in the neo-, post-colonial and neoliberal capitalist society. But, the subaltern must become the real subjects in history, and for their own destiny. Minjung, the underclass people feel left out and do not participate in the public political arena.1 They are chronically dependent on the welfare subsidized by the state and by the church. They become powerless like powerless and weak God. Now, some theologians in the trends of postmodern and postcolonial mode of thought tend to speak out for the powerless God as opposed to traditional conception of the sovereign almighty God, because the latter has long served to support the oppressive secular powers. For me, instead of the powerless God, we need the conception of God with a compassionate and just power. Here we must walk into the territory of defining what we mean by a compassionate God with power of justice, and at the same time evade such wrong conceptions as the God for a just war/violence. In order to establish justice in the world, each individual member of society must have power and the right to participate in deciding what scheme of the society is acceptable and legitimate in light of justice. But many people are becoming subalternized and subsided into voiceless and left out without rights to participate. If minjung and the subaltern must be included in decision making for the society-building, the operative justice and its principles must be justified by the least benefited and the powerless discursively. This is the reason why I am using the term justificatory power, to borrow the term from Rainer Forst, a German political philosopher. Forst argues that because the idea of justice is so wide and obscure, that once it is fixed by some metaphysical foundations and principles and norms, it becomes out of context and can be invalid to our different contexts. So he uses the term justification to establish a valid idea of justice for a particular context. He argues that justice concerns and refers to the basic structure of society, and it must be understood intersubjectively and procedurally, in other words, the basic structure of society must be justified by principles that all members of society can agree upon.2 Therefore the criteria of justice are not authority but reciprocity (“without demanding more from others than one is also willing to concede, and without projecting one’s own interests and convictions on others”) and generality (“without excluding any ones concerned and their needs and interests”) among members of society.3 So, people must be equal and free, as equally entitled participants in the discourses of justification for justice. Counter, alternative subjects are ripped-open, down-trodden, silenced, bisected by the state and the capital, and become subaltern subjects. Subalterns are mute or muted; silent or silenced. Counter subjects are divided and mutilated and forced to be non-beings in society. But the society may be transformed when these non-beings and nothings become historical subjects. Subjectivation is like transformation from dried bones to a live army. Justice in the context of monolithic imperial neoliberal system must be a resisting justice. Justice in the context of conflicting subjects is first of all the resubjectivating the subalternized people. Subjectivation is a key concept for both justice and mission. But both subalternizing process and scapegoating process for minjung are rampantly undergoing. The people in North Korea in the global context is being subalternized and muted and mutilated, but they resist to survive. The 90% of the South Korean people are also becoming subaltern scapegoats. Mission is a reverse of subalternization and a process toward subjectivation, becoming agents of justice. Institutions of representation such as the parliament and the investigative and prosecutorial system are not effective in faithfully representing the needs and demands of the poor. In fact, the parliament and the national bureau of prosecution are the representative body most criticized by ordinary people for they do not faithfully respond to their real needs and demands. In order to show how the representation system has fallen down in Korea, I would like to illustrate the case of Sewol-ho, a ferry that sank into the sea off the southwest coast of Korea, sacrificing 304 lives, the majority of whom were high school students on the journey to Jeju Island for school vacation. Ordinary people who watched the TV broadcasting the scene of the sinking ferry, was shocked and outraged, because the marine police and other security officers did not do anything to rescue them, simply watching from afar the sinking ferry. The marine police was not ready for or capable of rescue of them. There was plenty of time before the ship totally submerged into the sea. It was a crucial and precious time in which even some of the victims might be rescued by the marine police and divers and other equipment. But no one was rescued from the sinking ferry except those who were on the deck. It was discovered that the ferry had been dangerously rebuilt from original shape, and was overloaded by shipments. So the ferry was clearly unsafe to sail in the sea. The inspections by the authorities had been done in negligence; such an unsafe ferry had been validated as safe. It is apparent that there had been connections between the company and the authorities. The ferry company is owned by a religious charismatic figure who has led a sectarian group. Recently he was found dead. The company hired a retired captain, at a temporary employment base, and paid him less than half the salary of the ordinary captain. The captain was the first who escaped from the sinking ferry with his crew members. He and his crew did not make announcement that the people on board should move quickly and orderly to escape from the sinking ship. Instead the announcement that was repeated was: “Stay. Don’t move from your present location.” The crew escaped at that moment from the ship. People began to demand justice about this human-caused disaster. It was an accident, but it was not such an unpreventable one like a tsunami. The families of 300+ victims demanded a thorough investigation of this incident. Their mistrust of the prosecutorial authorities of the government led them to demand to form an investigatory commission where experts on this matter and the victims’ family be members and that the commission be entitled to the power of prosecution. People know that this incident occurred because there were corrupt, exploitative, neoliberal power structures behind the incident. People call for a thorough investigation into the whole of structured evil. But recently the government and the parliament decided not to accept the demands of the victim families and to go on with existing investigative and prosecutorial authorities. People and victims’ families demand that they be the agents, not simply remain recipients and clients in the matter of justice. Participation as subjects and agents with effective power is the core of the demand of justice by the victims and families and other conscientious people. But the established power is afraid of people’s participation and their power that may disclose the scandalous practices of the authorities including the state president and disrupt the status quo of the representative system. Participatory justice is an indicator of a healthy democratic society. If not for participatory justice, there will be perpetual mistrust and instability in society. Because our Asian society used to be an authoritarian one due to the lack of democratic reforms and revolutions by people’s power, and furthermore it has been dominated by colonial powers and later by globalized neoliberal capitalist market system, it is doubly distorted and skewed with respect to the participatory justice. Ordinary people remain recipients and clients, while the state and the elite are active patrons. In such situation, participatory justice with effective power is a requisite element of justice. Recently Thomas Piketty, the author of Capital in the Twenty-First Century, argues that “we live in ‘patrimonial capitalism’.” By the latter term, he means “inheritance-based capitalism.” In the 21st century, the wealthy get wealthier because they have inherited wealth from their parents.4 Such tendency has become stronger since the mid-1970s, when policies of the social welfare state in the West were dropped in favor of neoliberalism, Reagan and Thatcher’s major policy. It was also the case in Korea. In a society and a world where any change of the basic trends is not possible due to the disproportionate power allocations, despair builds up. There are disparities in power. The poor and the weak are becoming the majority. Only few hold the decision making positions. In such a situation, there is grave despair about the future of the world. It is a world of inequality in power. One side dominates the other. There seems no possibility to change it.